As soon as I saw this post on The Amateur Gourmet, I emailed J and told her we had to make them using her stand mixer. They are based on the recipe from the Momofuku Milk Bar Cookbook, which by all accounts is frankly amazing. And while we were very pleased with the results, I am tweaking it to compensate for the fact that 1) there was way too little flour in the recipe, 2) I found the results too salty this time around, 3) why make a single batch of 8 when you could make a double batch of 16 and 4) some ingredients can be tricky to find in London, so I've just omitted them. So below, you'll find my version. 1. Put the cream cheese in the bowl of a stand mixer fitted with the paddle attachment and cream it on medium speed, until fluffy. Scrape down the sides of the bowl and add the scallions and sugar and paddle briefly to incorporate. Taste to adjust. 3. To make the dough, stir together the flour, salt and yeast in the bowl of your stand mixer using the dough hook like a spoon. Continue stirring as you add the water, mixing for 1 minute, until the mixture has come together into a shaggy mess. 5. Brush a large bowl with oil and dump the dough into it. Cover with plastic wrap and let the dough proof at room temperature for 45 minutes. 6. Preheat the oven to 325F (163C). 7. Scatter flour over a smooth, dry surface. Punchdown and flatten the dough on the surface. Use a dough cutter to divide the dough into 8 equal pieces. Use your fingers to gently stretch each piece of dough out into a mini pizza between 2 and 3 inches wide. 8. Put a cream cheese plug in the center of each dough circle. Bring up the edges of each round and pinch to seal so that the cream cheese plug is completely contained, then gently roll the ball between the palms of your hands to ensure the bomb has a nice, round, dinner roll-y shape. Arrange the bombs 4 inches apart on a parchment- or Silpat-lined cookie sheet. 9. Whisk the egg and 1/2 teaspoon water together and brush a generous coat of egg wash on the buns. Sprinkle a heavy even coating of the sesame seeds all over the bagel bombs–every possible inch, except for the bottoms, should be coated. 10. Bake the bagel bombs for 20 to 30 minutes. While in the oven, the bombs will become a deep golden brown and a few may have cream cheese explosions. Continue baking until you see this happen! Not to worry–serve them as is or use your fingers to tuck the cream cheese back inside the bagel bomb. 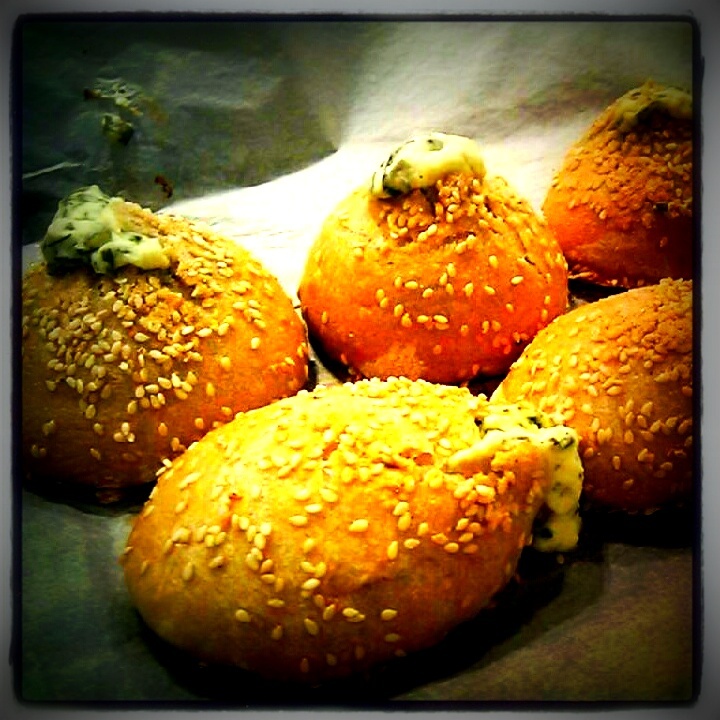 Bagel bombs are best served warm out of the oven–or flashed in the oven later to warm and serve. If you can’t finish them all right away, once they are cool, wrap them well in plastic and store them in the fridge for up to 3 days.